In May of 2010, Calvin started The Monsoon Diaries as his personal travel blog where he would post daily updates to let the world (and his mother) know he was okay. As his readership expanded, a large humble following of good people asked if they could join on his adventures. So what began with a trip for a few friends now has blossomed 5 years later into the popularly recognized travel style known as monsooning, and has featured on TEDx, The Huffington Post, USA Today, National Geographic, Business Insider, and Rachel Maddow. Every few months Calvin himself, and some of his most dedicated repeat monsooners, will lead scores of international young-at-heart travelers on their premier expeditions around the world. Take a look at any of the offered trips below and sign up even if you’re just curious about travel; we will take care of the rest! 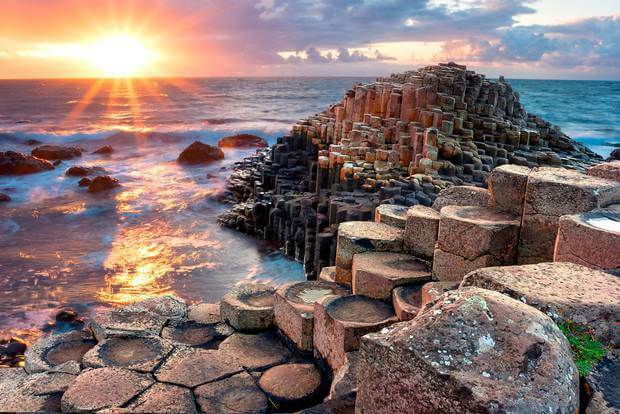 Head on an unforgettable roadtrip as we make our way to Belfast in Northern Ireland, including a 2 day visit exploring the rarely-visited Isle of Man as well as a visit to one of nature’s wonders — Giant’s Causeway! 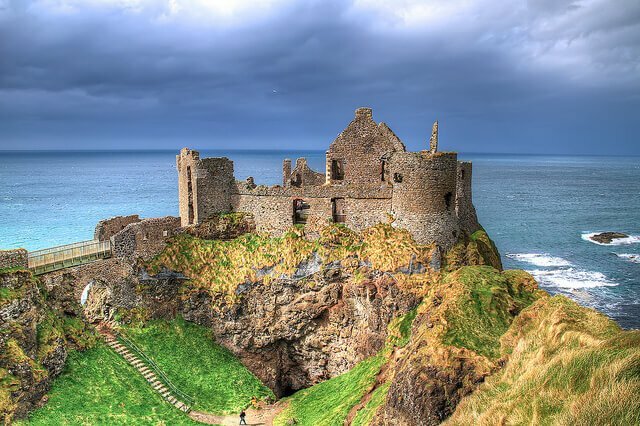 And if you’re a Game of Thrones fan, you’re in luck as we’ll visit House Greyjoy at Castle Dunluce as well as the Dark Hedges! “Momentum comes from pushing, not from planning. Confidence comes from scars and risk, not from indecision.” – Life Doesn’t Start Tomorrow. It starts with *you*. None of the following will ever matter unless you commit to your decision. Yes, dropping everything for something totally new and unknown can be scary! But nobody ever learned how to ride a bike by reading about it; you have to get on the damn thing! So get on and go! You might respond with “Yeah, but…” “’Yeah, but…’ is pernicious. Because it makes it sound like we have the best of intentions when really we are just too scared to do what we should. It allows us to be cowards, while sounding noble.” – 3 Reasons to Travel While You’re Young. Let’s entertain the possibility that you’ll skip out. Then watch us as we come back safe and sound, share our stories, show you our photos, and talk about how our lives have changed. Whether or not you will realize it then, when you have your first child, when in your midlife crisis, or on your deathbed, you’re inevitably going to regret that you missed out on an epic once-in-a-lifetime opportunity. This could set the tone for the rest of your life. Don’t let this happen. Starting slowly never ever works in travel and habits become harder to break once you’ve accustomed yourself to a way of approaching new experiences. Do you think that to skydive you first have to look it up on Wikipedia, or learn to fall off a table? No. You simply jump. So those of you who want to travel, travel. And imagine how easy traveling will seem to you afterwards. Imagine how much confidence you’ll gain in yourself. Imagine the bragging rights and stories you’ll have when you come home. Not many people realize that the opportunity for a tremendously positive life change is right in front of their faces: This could be the very moment where you turn your life around and finally do something *epic*. The world won’t wait for you. OK, I'M INTERESTED: How do I pay? A 40% down payment is needed to secure your spot on the trip. We accept credit cards, cash (in person), mailed check, PayPal, Chase Quickpay, Square Cash, or Venmo. What days should I book my flights to arrive? Depends on what part of the trip you sign up for; please confirm with us directly before purchasing tickets! Do you provide flight advice/support to get the cheapest flights? Yep! We boast expertise in this area and would be happy to assist you in booking the cheapest flights, finding hack fares, or work with loyalty mile programs to getting you free economy, business class, or first class flights. I’d love to come, but I’m limited on budget. Contact us anyway and we can come up with a deal or financial aid packages. Yes, many of our monsooners have joined our trip by themselves and end up meeting a whole new group of friends. We usually attract people who come from a range of backgrounds and have different levels of experience with travel. What if I don’t usually like traveling with people? Our trips are designed by independent travelers with independent travel in mind — we want to provide everyone with the opportunity and experience of traveling alone should they choose to. Therefore, there’s zero pressure to stick with the group anytime. So if you want to venture off to a museum or try a different restaurant, by all means: Do it! The group will only be expected to stay together for transportation between cities. Will you accommodate food restrictions? Of course. Just tell us ahead of time when you sign up and we can make accommodations easily. Depends on your nationality and type of passport. People with USA and EU nationalities do not need visas. Otherwise, we can help you with this if you need any visas. Please ask! A 40% deposit is due upon booking confirmation and is non-refundable. The balance of payment is due 1 week before the tour commences. Following receipt of deposit customer is required to send relevant details for issuing of relevant permits. 12 weeks (90 days) prior to the tour customers receive a 100% refund, minus associated and unrefundable costs. 60 – 89 days prior to the tour customers receive a 50% refund, minus associated and unrefundable costs. 8-59 days prior to the tour customers to receive a 10% refund, minus associated and unrefundable costs. In the event of an uncontrollable event, such as war, revolution, and or natural disaster, the customer shall be entitled to a full refund. What constitutes force majeure is decided solely by the company. 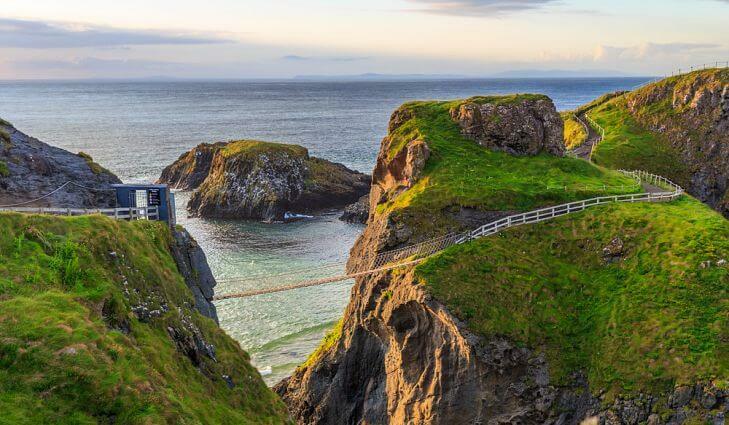 The entire trip covering Belfast, Isle Of Man, and Giant’s Causeway! Prices may increase even further the longer you wait; you can secure the lower price by submitting a 40% down payment before then and pay the rest when the trip begins! E-mail us at calvin[at]monsoondiaries[dot]com if you want to sign up for updates (replaced bracketed text with appropriate punctuation, obviously). Head on an unforgettable roadtrip as we cover all 7 emirates and even the 2 off-the-beaten-path exclaves of Oman nearby of Madhah and Khasab. From the glitterati of Dubai to the epic grand mosque of Abu Dhabi to the “Norway of Arabia” in Khasab, let’s go make the most out of your 3 day weekend away from home! Fans of the Travelers’ Century Club (TCC), Nomads Mania, or Most Traveled People can tick off 9 more regions off their list in a single weekend! June 24: Return to Dubai & home! “Momentum comes from pushing, not from planning. Confidence comes from scars and risk, not from indecision.” – Life Doesn’t Start Tomorrow. It starts with *you*. None of the following will ever matter unless you commit to your decision. Yes, dropping everything for something totally new and unknown can be scary! But nobody ever learned how to ride a bike by reading about it; you have to get on the damn thing! So get on and go! You might respond with “Yeah, but…” “’Yeah, but…’ is pernicious. Because it makes it sound like we have the best of intentions when really we are just too scared to do what we should. It allows us to be cowards, while sounding noble.” – 3 Reasons to Travel While You’re Young. Let’s entertain the possibility that you’ll skip out. Then watch us as we come back safe and sound, share our stories, show you our photos, and talk about how our lives have changed. Whether or not you will realize it then, when you have your first child, when in your midlife crisis, or on your deathbed, you’re inevitably going to regret that you missed out on an epic once-in-a-lifetime opportunity. This could set the tone for the rest of your life. Don’t let this happen. Starting slowly never ever works in travel and habits become harder to break once you’ve accustomed yourself to a way of approaching new experiences. Do you think that to skydive you first have to look it up on Wikipedia, or learn to fall off a table? No. You simply jump. So those of you who want to travel, travel. And imagine how easy traveling will seem to you afterwards. Imagine how much confidence you’ll gain in yourself. Imagine the bragging rights and stories you’ll have when you come home. 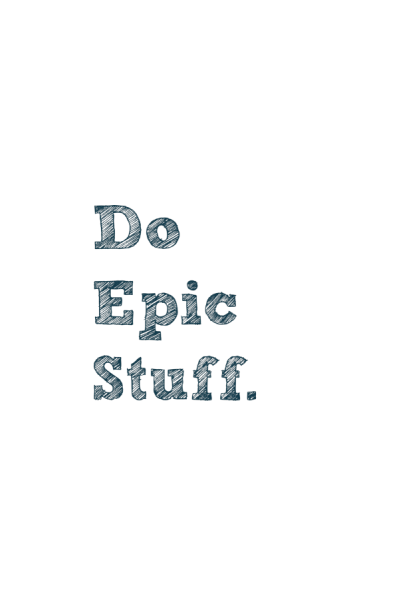 Not many people realize that the opportunity for a tremendously positive life change is right in front of their faces: This could be the very moment where you turn your life around and finally do something *epic*. The world won’t wait for you. A 30% down payment is needed to secure your spot on the trip. We accept credit cards, cash (in person), mailed check, PayPal, Chase Quickpay, Square Cash, or Venmo. Our trips are designed by independent travelers with independent travel in mind — we want to provide everyone with the opportunity and experience of traveling alone should they choose to. Therefore, there’s zero pressure to stick with the group anytime. So if you want to venture off to a museum or try a different restaurant, by all means: Do it! The group will only be expected to stay together for transportation between cities. A 30% deposit is due upon booking confirmation and is non-refundable. The balance of payment is due 1 week before the tour commences. Following receipt of deposit customer is required to send relevant details for issuing of relevant permits. CANCELLATION POLICY All cancellation notices must be received in writing and will become effective as of the date of receipt by MD. Tour refunds will be given according to the table below. TOUR ITINERARY Due to the nature of travel/tourism of certain countries, itineraries do not provide or imply a guarantee of the tour’s contents. Though we will make every effort to keep itineraries as described and to find suitable replacements, the company reserves the right to make changes to the itinerary in response to unforeseeable events. TRAVEL EXCEPTIONS MD reserves the right in extreme cases to refuse service to anyone we deem unsuitable for one of our tours, in the event that MD deems you unsuitable prior to a tour any payment made to MD will be refunded minus associated transfer costs. TRANSIT VISA In the event the customer intends to travel to and from a country using a transit visa they bear full responsibility for ensuring the transit visa is organized correctly. MD will of course offer assistance in the event of issues arising with customer’s transit, but will in no case be held liable for any costs incurred in arranging customer exits. Prices may increase even further the longer you wait; you can secure the lower price by submitting a 30% down payment before then and pay the rest when the trip begins! Partnering with Young Pioneer Tours (and if USA visas are approved), we plan to travel to Syria for a week this August and will be able to bring up to 7 others with us. There are now many parts of Syria (especially Damascus, Palmyra, and Aleppo) that are rebuilding and the Syrians want to get back on their feet more than ever. Tourism is now open and we will NOT be visiting active war zones. That said, we condemn visiting Syria for the purposes of “dark tourism”, where people come just to gawk at the horrendous. This is not what we will travel for — we don’t seek turmoil, but rather to humbly witness the rebuilding of a proud and rich society in the face of global inequity. Before the war, Syria was once regarded as a beautiful country for tourism with the most hospitable people. Now Syria has become internationally notorious all for the worst reasons: Dictatorships, rebellions, Daesh, rebels, crushing sanctions, war, and destruction. However, it does not have to be this way. With the war essentially over, Syria is now at a unique point in its history. Although a trip here may be not as hunky dory as a postcard from France, the next few years will be remembered as an integral part of their story and shouldn’t be ignored. Although I still contemplate the mental hurdles of returning to Syria, I’ve been consistently reassured by folks currently there that our presence will show that the world is not against them, that there are people outside their borders that don’t regard Syria as an evil place of war and death, and that our patronage for their local-run restaurants and hotels will help them rebuild. Most of all, recent (responsible) tourism in the region already have helped some feel like normal people again and accepted back in the world. Without question the local Syrian people are eager to step back onto the world stage in a positive light and show off their rich culture, to demonstrate their once-famous hospitality, and to stop being stereotyped as the place you’ve only read in the news about Daesh. So what better way to help then do that than by develop your own opinion, travel there, and experience the country for yourself? Let us know what you think, and if you are interested in joining us, send us a message. A 50% down payment is needed to secure your spot on the trip. We accept credit cards, cash (in person), mailed check, PayPal, Chase Quickpay, Square Cash, or Venmo. A 50% deposit is due upon booking confirmation and is non-refundable. The balance of payment is due 1 week before the tour commences. Following receipt of deposit customer is required to send relevant details for issuing of relevant permits. Prices may increase even further the longer you wait; you can secure the lower price by submitting a 50% down payment before then and pay the rest when the trip begins! We’re returning this Fall to the Eastern Coast of Africa, journeying on a dizzying itinerary covering both the most and least visited parts of the great continent. We kick off with a highlight in the legendary city of Stone Town in Zanzibar, renowned for its unique mixture of Arab, Persian, Indian and European elements that gives it its designation as a UNESCO World Heritage Site. After 2 days exploring ethereal Stone Town and the rest of Zanzibar, we’ll then fly out to the region of Mount Kilimanjaro from where we’ll embark on the legendary 3 day safari to the great Serengeti and unreal Ngornogoro Crater. Afterwards it’s another day in paradise in the Seychelles before beginning our final week in the 4th largest island in the world, Madagascar. Starting in the capital city of Antanavarino, we’ll then fly to Morondava to take a walk among the unique trees along the Avenue of the Baobas. Afterwards we’ll finish off our journey with the majestic stone forests of Tsingy de Bemaraha. Don’t miss out on an adventure of a lifetime. The entire trip covering 8 autonomous nations: Tanzania, Zanzibar, Comoros, Mayotte, Réunion, Mauritius, Seychelles, & Madagascar! The legendary stone town of Zanzibar + a safari trip of a lifetime to Ngorongoro Crater & Serengeti beginning from the Mount Kilimanjaro region! Island hopping off the coast of Africa: Comoros, Mayotte, Réunion, Mauritius, & Seychelles! + Prices may increase even further the longer you wait; you can secure the lower price by submitting a 30% down payment before then and pay the rest when the trip begins! Walk along the Avenue of the Baobab and visit the stone forests of Tsingy de Bemaraha! 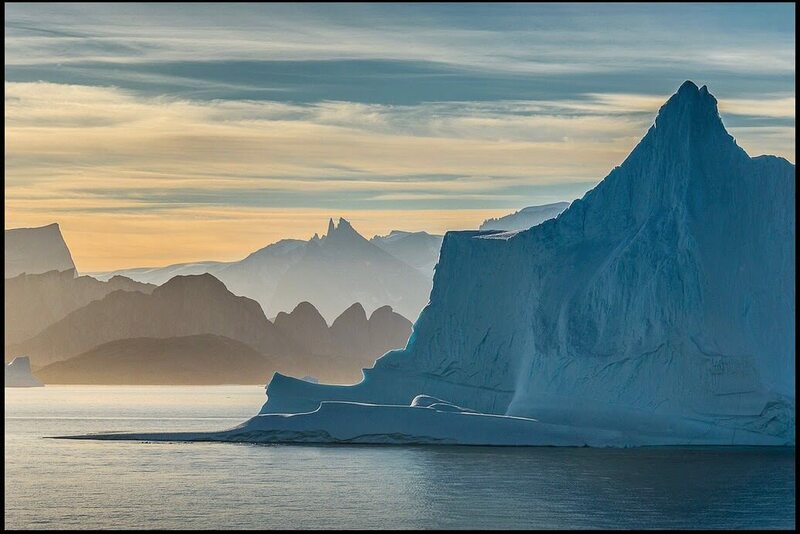 Join us and our longtime partners at YPT and Oceanwide Expeditions for the sequel to our 2014 trip to Antarctica: The northern edge of the world of Eastern Greenland. We begin in the capital city of Reykjavik, Iceland — where we visited back in 2014 — exploring the town for our first day before taking a charter bus up north to Akureyri. There we’ll board our home for the next week, the brand new m/v Hondius, as we depart for the the Denmark Strait in the early evening. 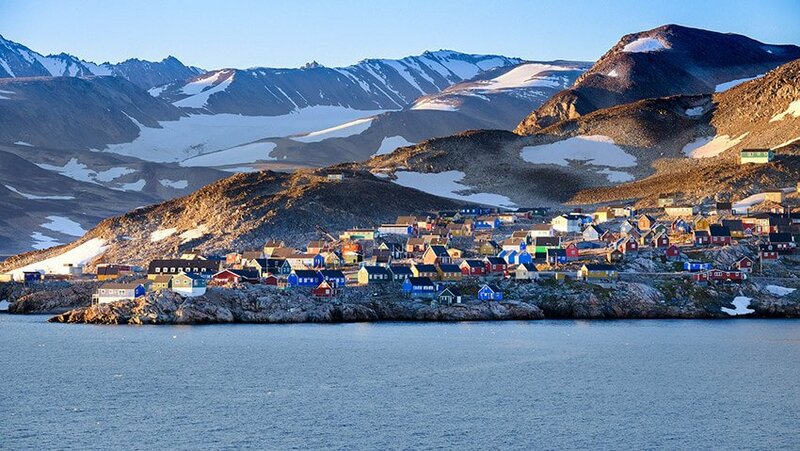 We’ll spend a full day sailing Greenland Sea to arrive the next morning at Ittoqqortoormiit, a settlement of 452 people in a region known for its polar bears and seals. Thus begins our 5 days exploring Eastern Greenland, including the remains of an Inuit settlement at Danmark Island, Sydkap, the tundra of Liverpool Land by Hurry Inlet, the dazzling reflected lights of Hall Bredning, the plains of Turner Sound, the calm waters of Rømer Fjord and the magnificent icebergs of Røde Fjord. 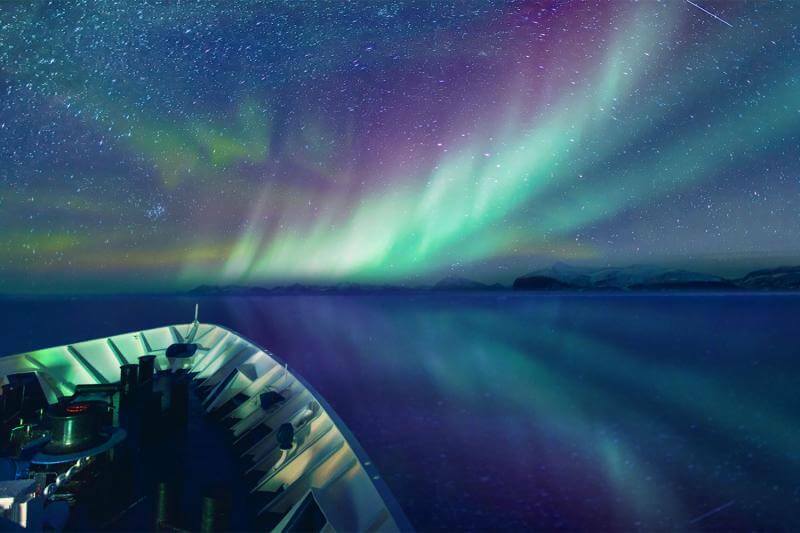 Trip extras include plenty of opportunities for viewing the Northern Lights, kayaking, SCUBA diving, zodiac cruising, hiking, onboard lectures, and plenty of sustainable and responsible wildlife spotting. Don’t let once-in-a-lifetime opportunities like these pass you by before it’s too late: Sign up today! Meet up for our pre-tour meeting at 6:00 pm at the Lebowsky Bar. Reykjavik’s own homage to the cult movie to meet the members of the group and have a great White Russian. We depart in the morning via chartered bus from the city hall of Reykjavik on a six hour trip to Akureyri, in the north of the country. From there we will embark the ship of adventure, none other than the brand new Hondius. Departure! In the early evening we will sail towards the Denmark Strait. Dinner and our first night aboard the ship. On the way north, we will look out for arctic animals with the local specialists able to answer our questions about all creatures we will encounter. We can expect to see fulmars, kittiwakes, gannets and guillemots. During the day, we’ll cross the Arctic Circle and if we’re in luck, might be able to spot whales. During the evening, we can expect to see our first icebergs as we get near to the east Greenland coast, near Brewster. 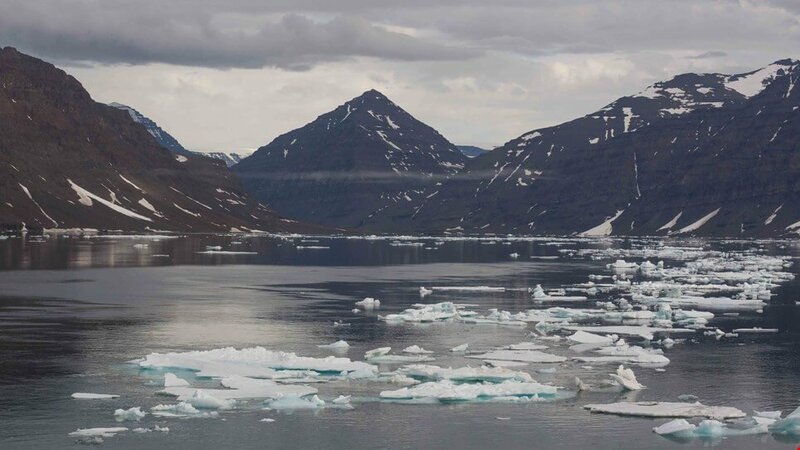 In the morning, we’ll reach Scoresbysund, known by the locals as Ittoqqortoormiit, a settlement of 452 people in a region known for its polar bears and seals. We’ll hop onto zodiacs to visit the glacier fronts and a visit of the basalt columns of Vikingebugt. In the afternoon, we’ll have reached Danmark Island, where we’ll land to explore the remains of an Inuit settlement. Due to the cold conditions surrounding the settlement, it has been very well preserved and it will be easy for us to guess what life was like on the settlement. 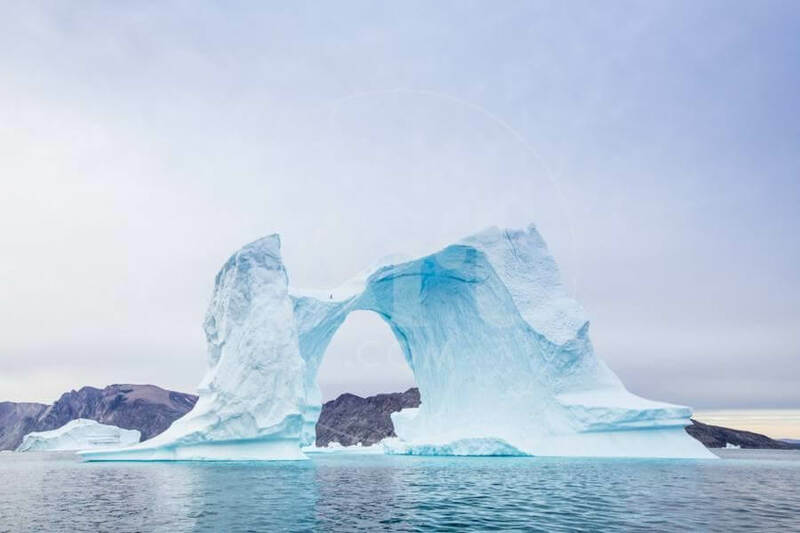 On today’s menu, a zodiac cruise to Røde Fjord where a mountainous coast meets with some of the world’s most beautiful icebergs in an all-natural myriad of colours. In the afternoon, we’ll head to the northern part of the fjord, where we can take in the colours of autumnal Greenland and maybe spy on a few musk oxen. This will be a great time for one of the many lectures we can attend to learn more about the flora and fauna of the land we are visiting. Today is iceberg day. During the day, we’ll get the chance to see enormous icebergs, some of which are taller than 100 metres and a few kilometres long! They are so big that some of them touch the bottom of the sea. In the afternoon, we’ll land near Sydkap, where we’ll have the opportunity to see one of the most iconic sights in Eastern Greenland, Hall Bredning, renowned for its dazzling display of reflected light. Time and weather conditions permitting, those who have signed up for the kayaking supplement will be able to go on their first outing. Things will get even more exciting in the afternoon as we’ll reach Ittoqqortoormiit, this time landing here. We’ll get to experience life in Greenland, seeing people going about their business on their sleds pushed by dogs. You may have sent a postcard from Pyongyang, and here you can send postcards too! In the afternoon, we’ll head back on the boat to sail south, following the gorgeous Blosseville Coast. Today, we’ll head the most inland of our trip as we will explore Turner Sound and Rømer Fjord. 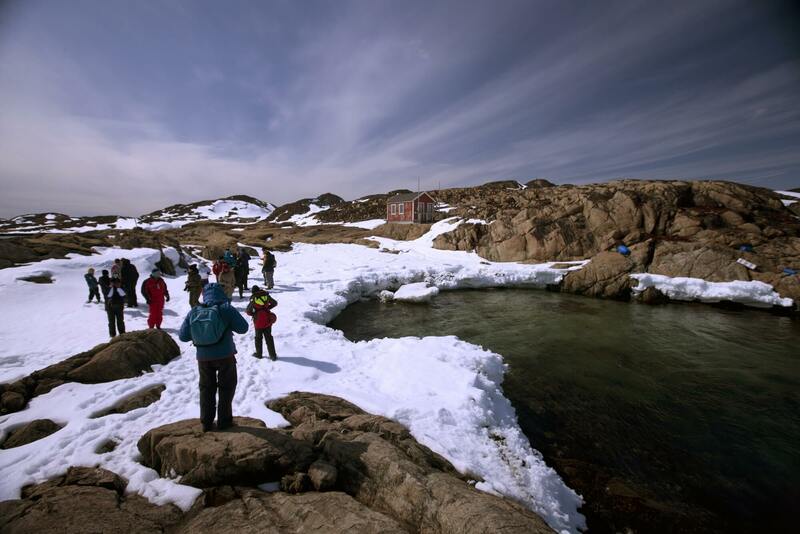 If we’re lucky, we might spot narwhals and polar bears here! 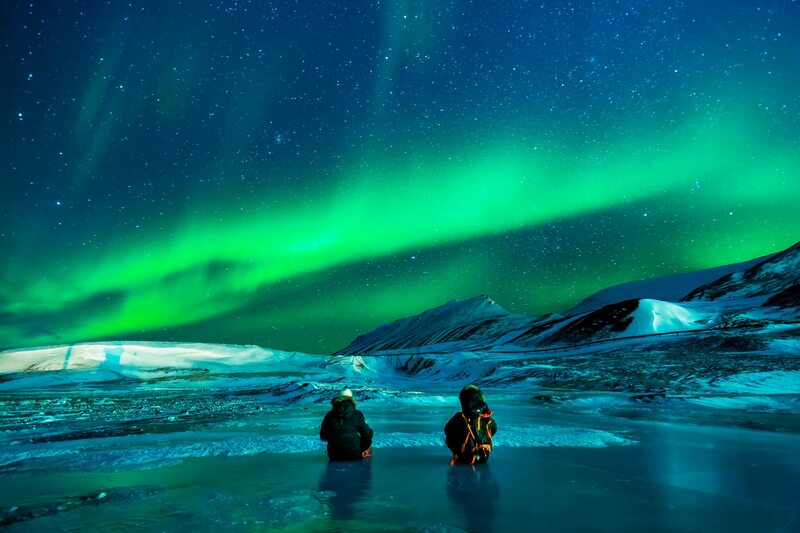 In the evening, we end our trip on a memorable note as we will hopefully get to sit back and take in the Northern Lights. DO YOU HAVE PHOTOS FROM YOUR PREVIOUS, SIMILAR TRIPS? Start here and work your way forward: First Landing In Antarctica. WHAT ARE WE SAILING ON? 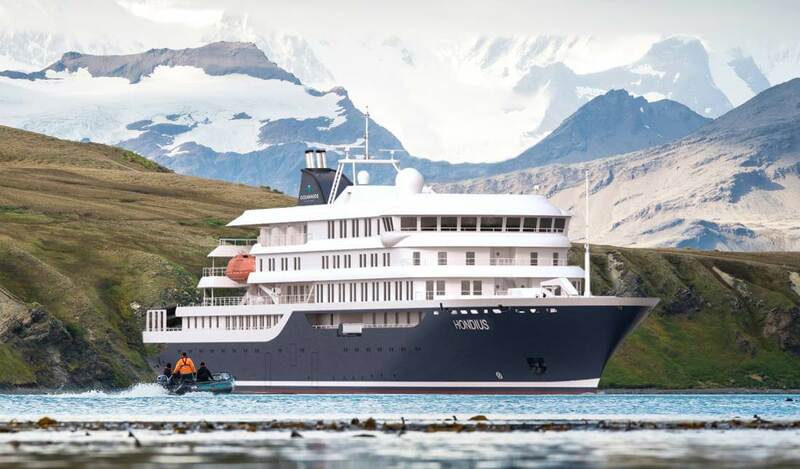 We will sail on the Oceanwide Expedition’s brand new m/v Hondius. Sample pictures & layout of our cabins: Cabins aboard m/v Hondius. The entire trip from Reykjavik, Iceland to Greenland and back! Prices increased after December 31st, 2018 at 11:59pm EST. They may increase even further the longer you wait! You can secure the lower price by submitting a 30% down payment before then and pay the rest when the trip begins! Join Young Pioneer Tours and The Monsoon Diaries as we explore for the first time one of the biggest countries of Africa – Algeria. Often compared to the rest of French speaking North Africa, Algeria is a jewel for travelers. Contrary to Morocco and Tunisia, most of Algeria hasn’t been exposed to mass tourism yet, making it a very authentic and mysterious experience of the Maghreb. It wouldn’t be a YPT/MD trip without going completely off the beaten track and this is why we will go visit the refugee camps of the Polisario, or the people of Western Sahara who have left their country hoping to muster their forces to take it back. Then in Casablanca, Morocco and ending in Nouakchott, Mauritania the second part of our tour will take us into unrecognised Western Sahara overland. Also known as the Sahrawi Arab Democratic republic (SADR) the country was declared independent in 1976 but has only been recognized by 28 states and has control only over a largely uninhabited eastern slice of territory. The trip will finish in Mauritania, a lesser-known country which rapidly became one of our favourites around the world. There we will take the famed Mauritania Iron ore train in open carriages into the Saharan sunset. The train is 3km in length and is one of the heaviest in the world. We’ll make one of those carriage our temporary home as we ride through the starry night of the desert on this high-adrenaline ride. This unique trip highlight is not to be missed! We’ll also ride through the desert to see UNESCO world heritage Chinguetti, a holy city of islam. We’ll tour its libraries and other historical monuments and buildings, then visit the incredible sceneries of the Adrar region and the ancient city of Ouadane before finishing up in the Atlantic fish-markets of the Mauritanian capital – Nouakchott. Thus begins Part 3 of our tour — The moment YPT did their research trip to Mali, they profoundly fell in love with the country. It is filled with opportunities for proper YPT/MD moments. Mali has been abandoned all together by mainstream tourism, but that doesn’t mean it isn’t filled with encounters with lovely people, a fascinating history and cultural context. Mali and Burkina Faso do not have much touristic infrastructures anymore. As such, a group tour there truly make sense, as we our expert local partners will organize our own 4WD cars and camping sites where accommodation isn’t readily available. It is, without a doubt, one of the most sensible way to see these countries and make the most of it! During this trip, we will visit Segou, the sleepy river town where we will mingle with the locals and learn more about the everyday Malian life. We then head to Djenne. While Timbuktu isn’t safe enough at the moment for us to confidently offer tours there, Djenne offers a great alternative, with the same kind of architectural wonders made of mud. This town, a UNESCO site, will be completely ours to visit and has a plethora of sites of interest. Leaving Djenne behind, we will then move to Mopti, which is right by the line of control by the UN forces, giving us an idea of the conflict that happens in the north but also giving us access to a very busy city of Mali. The boat ride we will be on in this city is one of YPT/MD’s definite favourite. A trip to Mali wouldn’t be complete without a visit of the Dogon Tribe. Using our great relation with one of the tribes, we will stay and visit one of the isolated village of the rocky plains. The scenery alone would be enough to justify a visit, but we will also get the chance to see an authentic mask ceremony, where, in the ancestral animist beliefs, the elders of the village chase bad spirits and bring the good ones. Those who follow us on part B will make their entrance in the second country of this trip: Burkina Faso. For the first time, YPT/MD will visit the country which was the scene of some of the most interesting development in the history of the idea of panafricanism and anti-colonial struggle. The birthplace of Africa`s Che Guevara: Thomas Sankara. On our first day in Burkina Faso, we will visit Yako, the town where Sankara was born. There, we will get to meet some of his relatives and learn more about his history. In Bobo Dioulasso, we live the proper Burkina village life, going around mosques, fetish and sorcery sites on horseback. We will get to witness life there up close, visiting many villages and spectating the different ethnic traditions of each of them. We can also expect breathtaking sceneries and abundant fauna with unique rock formations surrounding them. If this didn’t get wild enough, we’ll visit a village were people coexist peacefully with hippopotamuses! Our trip will end in Ouagadougou, where will we do a full city tour accompanied by friends and relatives of Sankara and a party to be remembered in the maquis, the open-air bars the Burkinabe swear by! This trip involves a fair bit of camping and might not be as comfortable as our other trips, but it is sure to offer an off the beaten path experience. We will be staying in accommodation we vouch for, with extraordinary people. Due to the logistical and infrastructural limitations that come with a trip to Mali and Burkina Faso, this trip is capped at 12 participants, with priority being given to people booking both parts. Make sure not to be left out! Join early! And if you do not have enough time to complete the whole itinerary, it is possible to also start from other cities along the way. Contact us for a special quote! End of tour, with YPT/MD able to arrange connections to your next destination! Oran has cheap flights to Paris, London, Madrid and Istanbul, amongst others. Dinner in a traditional Moroccan restaurant for an absolute feast followed by belly-dancing. Hit the old town and Medina to experience some of Casablanca’s dark and dingy nightlife! We spend the morning sightseeing around the Moroccan economic capital. While not aesthetically beautiful the city is Morocco’s most progressive and liberal as well as being culturally very diverse. It’s big on its gritty nightlife too so we’ll be sure to sample some of this! Hassan II Mosque. Biggest mosque outside of the Middle East and tallest minaret in the world! Visit the Corniche Boulevard. A once thriving resort area that used to bustle with several nightclubs. The area has lost its once glorious image but is still a fascinating part of town filled with plastic surgery clinics and nightclubs . Hit the road for Marrakech! Morocco’s third largest city is teeming with sights and sounds that emanate from its historical medina. Check into the hotel and hit the famous streets for a tour that starts with the Koutoubia Mosque. Some say its minaret is to Marrakech as the Eiffel Tower is to Paris! After traditional Moroccan fare for lunch we continue on with visits to the Djema El Fna Square and world famous souks. Dinner of streetfood on the square. Visit the freshly renovated Madrassa Ben Youssef. This Islamic School is the biggest of all Morocco! Just south of here we’ll check out the Royan Palace and historic Medina. Along the drive we’ll take in the stunning green oasis pools and the infinite olive, orange and pomegranate orchards. Visit the exquisite Majorelle Gardens which was laid out by the French expat Louis Maforelle and later restored by Yves Saint Laurent. It’s famed for its distinct cobalt blue buildings. Dinner followed by shisha and tea! Check out and drive to Agadir with a few scenic stops along the way! Lunch at the streetfood alley of Agadir where they serve delicious grilled seafood and fish. Take in the breathtaking panorama views from the Kasbah fortress. Sample some Moroccan whisky in Agadir’s seedy nightclub – Papagayo. It will take us about 8 hours total including the photo stops . On the way, we make a pit-stop by Tizmit , a town quite off the tourist track, with a vibrant and colourful fruit market where berbers shop in their traditional outfits. Continue the drive to Laayoune to the town of Tah, where we stop to see the monument to the Green March, or the moment where thousands of Moroccans came to what was then the border between Spanish Sahara and Morocco to cross and then claim the land . To this date , this serves as the contested border between Western Sahara and Morocco . We drive for an hour more, arrive in the evening and check into our central hotel. Dinner at Goût de Fes, your friendly local pizzeria. Overnight in the Hotel Rimel Sahara, Laayoune or similar. Visit the Spanish Cathedral. In 1940 Spain designated Laayoun as the capital of the Spanish Sahara and this is the best relic leftover from colonial times. If we are lucky, we might get to meet one of the three catholic priest in charge of all of Morocco and Western Sahara. They are quite eager to talk about their experience here, in a country where near everyone is muslim. We head to the dunes for late afternoon mint tea and games in the sand. Dinner on the way back at a local truck stop offering surprisingly good fare and enormous portions. On the way we stop at Boujdour and its famous lighthouse. Built by the Portuguese in the 18thcentury, the lighthouse is visible from miles around. Visit of Boujdour Port, where we will see the hundreds of fishing boats and fishermen going on with their busy day. Hit the beach and swim in the Atlantic ocean! Depart the city and head for the dune blanche – a place that must be seen to be believed. This enormous sand dune perched in the middle of a lagoon is a hotspot for flamingos. Visit of a natural hot underground spring where you can take a jet shower from a high pressure hose. The experience could be described as half massage, half waterboarding. The 38 degree Celsius sulfur water is said to contain many health benefits! Stop at the Ostrich Farm where you can prove your bravery by letting an ostrich pinch your hand! Free relaxation time before meeting up again for dinner and our last easy-to-find drinks at one of the restaurants on the main strip. Today we drive to the border of Morocco. We will first exit Morocco and end up in a five kilometres no man’s land. While the rest of Western Sahara is claimed by Morocco, this sliver of land is indisputably Sahrawi. Here, you will see stolen cars sellers, guns smugglers and refugees from the conflict, an intense 10 minute drive! We take a trip to the Atlantic ocean again at Cape Blanc. A peninsula that is shared between Mauritania and Western Sahara. It was here that the Spanish expanded their fishing presence from the Canary islands onto the African coast. This is where the biggest ship graveyard used to be located until it was broken down into pieces and the steel sold by chinese companies in recent years. If we are lucky, we might spot the Mediterranean monk seal colony there. Dinner at Ice NBC or similar, a family restaurant with a wide menu of delicious food . If you fancy a cold one we will visit the Chinese restaurant for the only place that openly serves beers.. Pick up some supplies for the epic train journey ahead. We will have plenty of water, fruits and sandwiches provided for us. *Trip highlight* Ride the famous Mauritania mineral train! The train is up to 3km in length with 200 cars weighing up to 84 tons making it one of the longest and heaviest trains in the world. We’ll be sitting in open top cars so make sure you bring a blanket and you’re wrapped up warm with a good scarf to protect your face from dust! The way we do it, there is no ore on the car, this allow us to get the best views when climbing up the ladder while still having room to move and use the walls of the car to protect us from the wind. Arrive in Choum at 3am and spend the rest of the night/morning in igloo tents! The city was for centuries the gathering point for pilgrims of the Maghreb to gather on their way to Mecca. Africans claim it as the 7th most holy city of Islam. Much of the old centre dates from the 12th century. On the way stop at isolated and lost cities of the Sahara where empires where founded. Lunchtime at hotel Mer et Desert. Here, we will probably meet the owner, a french woman who has left everything behind to become member of the community. She knows a lot about the social issues of local tribes and is a wonderful source of information. Once upon a time it was an important stop of the trans-caravan routes of the Sahara. In YPT/MD, we nicknamed Ouadane the Pompei of Mauritania for its sprawling city in ruins which is sure to amaze you. We’ll walk the streets and see the buildings that once glorifies the country as a whole and then move on to the new part of town where we’ll be sure to mingle with the locals. Traditional dinner and overnight in the Hotel Vasque, Ouadane. After an early breakfast we depart for Tergit Oasis. This is Mauritania’s most picturesque place. On the way, we will stop at Agrour to see some pre-historic paintings left there 5000 years ago as well as interesting lava formation. We then continue forward to the White Valley. Here, desert is trapped within dramatic cliffs – a breathtaking scenery. Lunch at San Francisco Cafe for a good meal and access to wifi after a few days of deprivation. Visit the local craft market and pick up a camel wool rug for yourself! Head to the beach for some great people watching. This is where local Nouakchottois come to escape the city and cool off. Late night dinner before trying our luck at geting in one of the Chinese owned restaurants and bars for a night cap! End of Part 2 for those who do not carry on to Mali! YPT/MD can help you arrange your connection to your next destination. For those carrying on to Mali, we will pay a visit to the Malian embassy to get our visas the quickest and cheapest way! We will visit the Rose Market of Bamako which will give you an idea of the hustle and bustle of the Malian capital, where many come to reach their dreams, very rarely successfully. We visit the tower of Africa, the highest tower in Mali. By this time, everyone should have arrive and so we meet for our greeting dinner as well as a short orientation about the do’s and don’ts of Mali. Bamako and Segou being the only two towns of Mali with somewhat of a nightlife, we will indulge! Up nice and early to hit the road to Segou. We will stop on the way to grab breakfast near a plantation and then stop again at the entrance of the city, to the monument to the kings that have ruled Segou where our guide will introduce us to the history of Segou. For those who will go to Burkina Faso, we stop by the consulate in the city so that our visas are processed during the day. We will leave our passport there and they will be prepared while we are touring. Lunch at our favourite local restaurant in Segou. Options aren’t plentiful but everything here is absolutely delicious! We head to the market of Segou for people watching but also to buy ingredients. Today we will be cooking. Helped by local ladies, of course! We have the chance to have our own crib in Segou, so we`ll make sure to make the best of it by organizing our own little house party, with an optional visit of the town’s best bars. Overnight in our own crib, Residence Djiguigombo with some of us camping and some of us having rooms. There, we participate in a traditional Malian tea ceremony. This afternoon, we head on a pinasse, the Malian boat of predilection to go on a cruise along the Niger river, the third biggest river of Africa. We can expect to see the lifestyle of the people of the banks, most of them being from tribes of nomadic fishermen. On the way, we stop in one of those fishermen village to interact with them and then stop again in a village of potters. In the late afternoon, we will drop the anchor and find a place to camp for the night! Our local team organizes the tent and a cook prepare a meal for us. After breakfast, we continue our boat trip to Segoukoro. In the old days, Segoukoro was the capital of the Bambara kingdom. There, we have an appointment with non-other than the village chief, who is a direct descendant of the kings of the old day. We have tea with him, with him available to answer all of our questions about the history of Segou and the royalty. The King’s descendant show us the rebuilt vestibule, where the king used to receive his guests. We tour the village, home to four mosques, the most famous being the waterfront one which the very famous king Biton Coulibaly built for his mother. In the late afternoon, we will reach Djenne. Djenne, or the capital of mud, is a one of a kind city made of narrow streets and buildings made of mud. While it used to be one of the jewel of tourism in Africa, it has been completely left alone in the recent years due to fears of most tourism company. We will thus get the whole town for ourselves to explore. We climb a nearby building to get a view of Djenne’s Great Mosque, the world’s biggest mud building. Truly a sight to behold. The inside of the Mosque can only be visited by Muslims. While we head out for dinner in a restaurant specially opened for us as the local economy has collapsed and restaurants aren’t opened daily, our team installs our tents in a local family’s compound. Overnight camping in our host family’s compound. Up in the morning for our city tour of world-heritage Djenne with our local guide who can answer all of your questions about the city and its history. We visit koranic schools as well as the museum of Djenne’s manuscripts, where a single man is trying to protect documents of the old days. We stop by the sacred well, where it is said the ancestors of the town were consulting the spirits to plan their next moves. For lunch, we try the local speciality of Djenne, the Tion Tion, a delicious fish fried rice. In the afternoon, we head out of the walled city and into the different surrounding villages. Each village is profoundly different from the others, as they were built by different tribes, such as Bozo, Fulani, Bambara and Sonrhai, with their own cultures and way of life. Overnight in Djenne camping in our host family’s compound. Mopti is right under the security corridor established by the UN Forces and an interesting city full of life. We grab lunch on the way to Mopti. Our afternoon will be dedicated to exploring Mopti and its bustling streetlife. It has a magnificent mud mosque similar to the one we saw in Djenne as well as a women’s market. In the late afternoon, we head for a boat ride around the busy port of Mopti. Here, the Bani River and Niger river meet. It is a important hub of transportation in Mali, with people here embarking on the dodgiest 3-day trip, aboard shabby penasse, to Timbuktu of all places! This boat ride is one of YPT’s favourite, around the world! Overnight in hotel Y’a Pas de Probleme. After breakfast, we do one last thing in Mopti: the Monday market! It is a wonderful place to stop and people watch as people from the surrounding region all gather to sell and trade their wares. We make our way to the Dogon Country, probably Mali’s wildest and most interesting part. Our first stop within Dogon Country is the town of Songo. From here, we’ll get to see a traditional Dogon village. The people here used to live up the rocks to keep their animistic beliefs and flee persecution from the muslims. Now, they have come down. We get to the place where this village organize the circumcision ceremony for the whole of the surrounding villages. Here, we find a big rock painting retelling the stories of the villages as well as the circumcision ceremony. It is here that boy become men by having their foreskin cut on a rock! Our guide will explain us all about the ceremony, which lasts more than a week. From there, we’ll climb up the mountain for an impressive view of the town. We stop for lunch in Bandiagara, the biggest town in the area. Our 4WD drops us in Aindelou, from here, we’re heading to an isolated Dogon village which we can only reach by a short 4 km trek through a rocky scenery like nowhere else. Don’t worry, we have porters to carry luggage for those of us who have too much luggage. On our way, we’ll stop through typical Dogon villages, our guide, from here, will be there to explain all of our questions about the local culture. We arrive in Begnimatu, YPT’s favourite Dogon village, where we introduce you to the most kind people and pillars of the society. Begnimatu is three villages into one, with a muslim, a catholic and a Christian neighbourhood. The village is perched on the mountains, in a canyon. Sunsets here are really a sight to behold. The locals prepare a feast for us. Since we’re in the Christian neighbourhood, we can have a party with the locals. It is also our last night with those doing only the Mali part of this trip so a farewell party is in order! We sleep in Begnimatu, camping on the houses’ rooftop under a very starry sky. TRIP HIGHLIGHT – After breakfast, we are invited to a traditional Dogon mask ceremony. Here, the elders of the village chant in order to chase bad spirits while the very sacred Dogon masks are taken out of their hiding place to be worn for a dance. All members of the community, muslims, catholics and animists alike, unite to reenact ancestral dances. After the ceremony, it is time for us to trek down the rocks, stopping by the villages of Doundiourou and Bagourou, where we can see traditional Dogon Justice Halls. Those justice halls, with ceilings too low for people to stand, are where family elders meet to discuss and solve issues peacefully. It is here that we part way with those heading back to Bamako. GROUP B starts making its way toward Burkina Faso. We cross the border and go through the necessary car and immigration formalities. Arrival in Ouahigouya, where we have dinner and overnight at Pension La Colombe. Group B wakes up in Ouahigouya. After a good breakfast we head down toward Bobo Dioulasso but it wouldn’t be a YPT trip if we didn’t stop in Yako. Yako is the birthplace of Thomas Sankara, the Che Guevara of Africa. While his time in power was very short and abruptly ended by the treason of his best friend and subsequent murder, Thomas Sankara is a very important figure of Africa. While he was ruthless, Sankara did a lot concerning education and empowerment of women and, as he didn’t last long enough to terrorize most people, is mostly remembered fondly. Our guide explains the history of Sankara. We arrive in Bobo Dioulasso in the late afternoon. We head out for dinner and then visit the maquis, typical Burkinabe open-air bars which turn into nightclub when the time is right! Today, we spend the morning visiting the second largest city in the country. We visit the old neighbourhood to get a feeling of what life used to be like in old Burkina Faso, or, as it was called in colonial times, the Upper Volta. We stop by the Sudanese style mosque Bobo Dioulasso is known for. 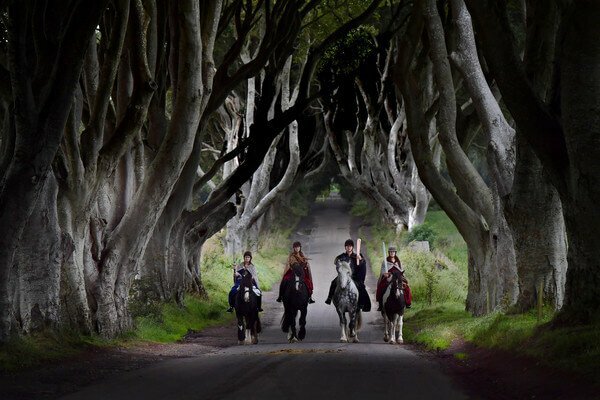 In the afternoon, we head out for nothing less than horseback riding to Dafra. If you don’t feel comfortable riding a horse, you can also get there in our 4WD. Dafra is known as a famous pilgrimage site in Burkina Faso and people come from very far to make offerings to the local fetishes, which are greatly renowned, in order to get good fortune. There are also sacred fish people pray to, which we will get the chance to see. Tonight, we will be bush camping! Our dinner is arranged here in the wild. Overnight camping in the wild. After our bush breakfast, we ride the horses back into town where we leave them and jump back in our 4WD to head to Niansogoni. Back in the days, Niansogoni, often referred to as little Dogon, was hidden on the mountainside. Due to its location, the buildings of days far gone are still well preserved. We can have a good look at what life used to be like and some parts of the village are still used for animist ceremonies. We have dinner in Niansogoni, mingling with the locals. After a good breakfast, we leave Niansogoni to head to our next destination. On our way, we stop in Kawara – a village of potters. It will take a bit of convincing but with luck and using the great contacts we have, we’ll try and convince the locals of organizing their traditional pottery dance for us. We continue to Sindou, one of the most well-known village of the Senoufo region. In the afternoon, we visit the village as well as check out the impressive rock formations for which it is renowned. It is the highest point of Burkina Faso. Each rock formation has a story, and our local guide is sure to tell us some of them! Dinner in Sindou, arranged by the locals. Early wake-up call this morning! We wouldn’t want to miss an epic sunrise boat trip. On the way, we are sure to spot some hippos. Here, hippos are seen as sacred animals and the beasts live in harmony with the locals. You can often see kids swimming right next to those animals which, elsewhere in the world, often have the reputation to be the deadliest! After breakfast on the lakeside, we continue to the Fabedougou Domes, natural rock formations which have to be seen to be believed! From there, we take a short hike of a kilometer and a half to the Karfiguela falls. We’ll reach Banfora in the afternoon just in time for the weekly market there. It is quite different from the one we’ve seen in Mopti but again reunites the people of the whole region who come here for some essential bartering. Today is our last bit of road and quite a bit of road (480 KMs) so we have to wake up early. Arrival in Ouagadougou, the capital of Burkina Faso. TRIP HIGHLIGHT – While its successors have tried to erase any trace of him, the memory of Thomas Sankara is still very much alive in the people of the city, this is why we’ll spend the day touring the city along with friends and relatives of Thomas Sankara, who will be there to explain us how the man was during his life. We visit the roundabout of the second of October, commemorating the day Sankara announced the revolution. It wouldn’t be right to leave Burkina Faso without a proper sendoff in the cities busiest maquis! Airport dropoff are organized depending on your time of departure, after lunch. For those leaving later, visits of the National Museum, Music Museum and handcraft market of Ouagadougou are on the menu! The entire trip covering Algeria, Morocco, Western Sahara, Mauritania, Mali, & Burkina Faso! All of Morocco, Western Sahara, & Mauritania! 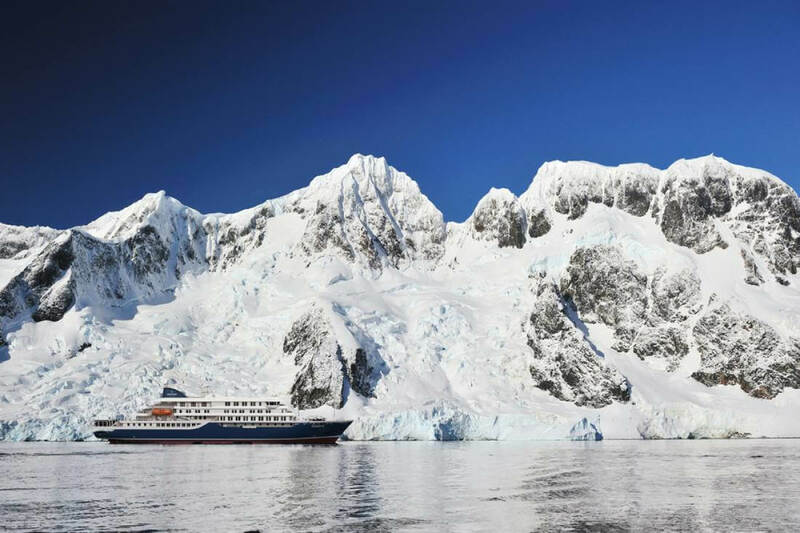 Join The Monsoon Diaries, Young Pioneer Tours, and Oceanwide Expeditions on a bespoke tour in the northern reaches of the world on a cruise around Svalbard visiting Russian settlements and abandoned coal mining outposts turned ghost towns! It’s not that usual we are this excited about something more than 18 months from now, but this tour has got our tastebuds tingling. 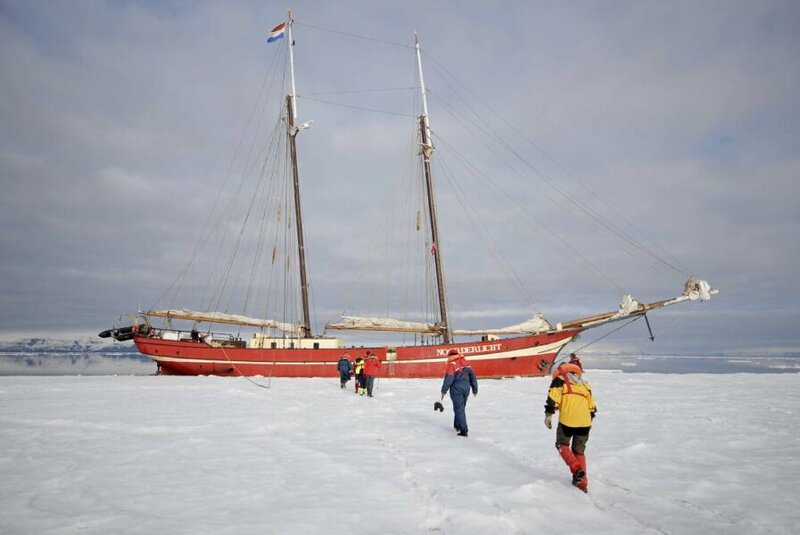 Not only will we be on an arctic cruise on the very cool s/v Noorderlicht in one of the most inspiring natural environments of the planet, but we’ll be ticking off most YPT boxes on this trip. 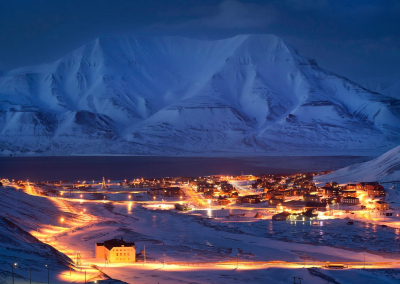 We kick off in the main town of Longyearbyen where we’ll get a feel for the kind of people who live amongst reindeer and polar bears, before heading on a cruise and stopping at Barentsburg, an old Russian mining settlement still populated by about 500 people. Here even though we’re still officially in Norway we’ll see the northernmost statue of Lenin in the world and grab a drink at the northernmost brewery! 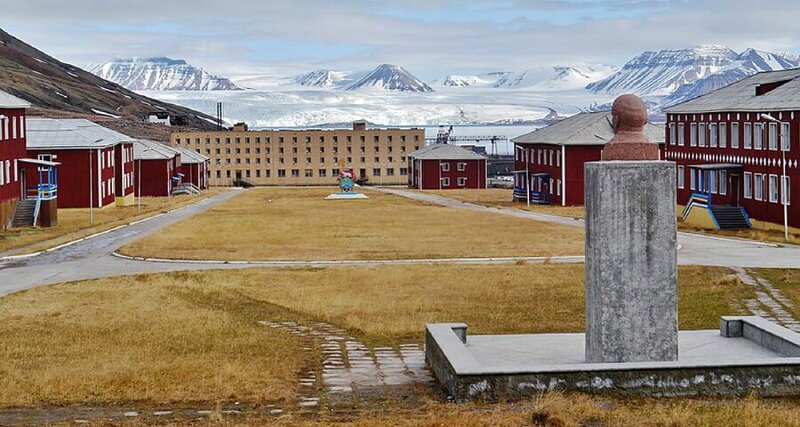 We then head to an arctic ghost town – the abandoned settlement of Pyramiden, built by the USSR, which is still completely intact with Soviet style architecture and a monument to Lenin! 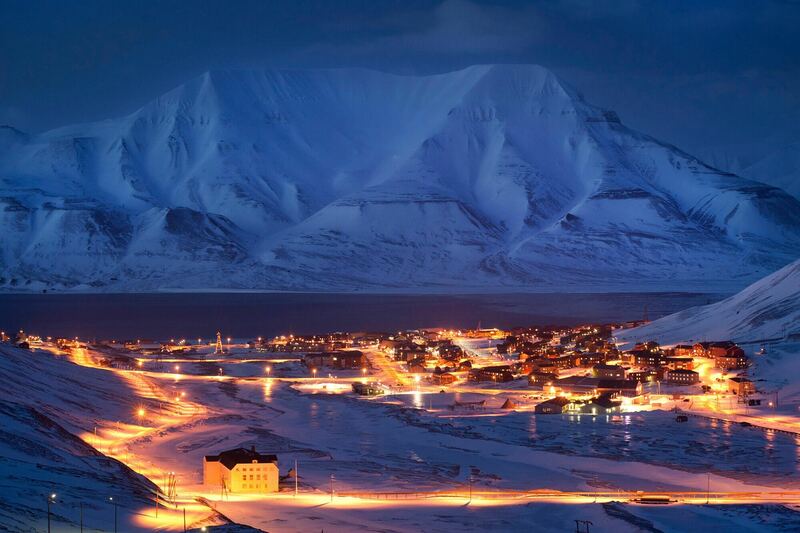 Longyearbyen is the main town in Spitsbergen, the largest island in the Svalbard archipelago, and the northernmost settlement in the world. Relax at Barentz Pub, the world’s northernmost bar. Fortunately being tax-free, a pint in Svalbard is way cheaper than the Norwegian mainland! After breakfast head out to explore Svalbard, we may bump into reindeer but it’s not advisable to leave the town centre without a rifle because of polar bears! Visit the Barentsburg Pomor Museum, a Soviet era museum from the 1960s. The museum mainly deals with the Pomors – Russian settlers from the Novgorod region – but has great sections on the Second World War and Soviet Era as well as local history. Barentsuburg is named after the Dutch explorer Willem Barentsz, who discovered Svalbarg in 1596, though the Russians claim it was Pomors who got there first. This may be officially Norway still, but we’re still YPT and so we pay our respects to the statue of Lenin! Never will you see a statue of Lenin looking out over a fjord with the colourful Scandinavian style houses in the background. We explore the abandoned settlement showing how the resident coal miners lived – it is predicted that because of the climate the buildings will remain largely as they are for another 500 years! See the world’s northernmost monument to Lenin! Finish our tour with a Svalbard pub crawl, no wandering off into polar bear territory though! We will sail on the Oceanwide Expedition’s legendary s/v Noorderlicht. Sample pictures & layout of our cabins: Cabins aboard m/v Hondius. The entire cruise in Svalbard! Prices increased after January 31st, 2019 at 11:59pm EST. They may increase even further the longer you wait! You can secure the lower price by submitting a 40% down payment before then and pay the rest when the trip begins!